Hamilton midfielder Darian MacKinnon was sent off for aiming a rude gesture at the crowd during the 0-0 draw with Hamilton. MacKinnon was targeted by a home fan in the 74th minute and reacted negatively, flicking a one-fingered salute that referee Kevin Clancy saw as a red-card offence. The goalless outcome hits both sides' survival prospects but Motherwell thought they had taken the lead inside the first half when Ben Heneghan's header appeared to cross the line. Motherwell's players made their point to Clancy, but he waved away appeals for a goal to be awarded. But they could not find a breakthrough as their winless run at Fir Park stretched to eight matches. The hosts made one enforced change to the side who earned a commendable draw against Rangers last time out, with Jacob Blyth stepping in for the injured Louis Moult. The visitors were also forced into a change, with right-back Giannis Skondras replacing Grant Gillespie, who sustained ankle ligament damage in the win over St Johnstone. Scott McDonald's flick-on from a corner fell to the feet of the Englishman, but he wastefully lashed wide from the edge of the six-yard box. 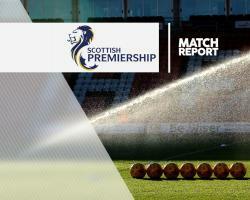 Hamilton toiled for large spells of the first half under the Fir Park lights and looked a team devoid of any ideas in their fight for Ladbrokes Premiership survival. MacKinnon's half-volley from the edge of the box forced Craig Samson into a smart save, tipping the ball round the post. Alex D'Acol went close for Martin Canning's men, striking the outside of the post with a 25-yard effort. Then came the moment of controversy which could prove pivotal in the race for survival. However assistant referee Willie Conquer, who was in line with play, adjudged that the whole ball was not over. Replays suggested the ball was at least a yard over the line, which will add to the frustration of Steve Robinson's men. Chances were few and far between in the second half, with both sides not committing too many men forward in fear of losing the match. Elliott Frear went closest for the Steelmen, lashing a volley just wide of Remi Matthew's left-hand post. MacKinnon then took centre stage, with his response to the Motherwell crowd's chiding, meaning Hamilton had to battle through the closing stages a man down.